Built-in entertainment centers are home features that require hose renovating their homes to think ahead, going beyond what’s in vogue today. The ways we live in and interact with our homes change with each passing year, so it’s important to consider how you will use an entertainment center well into the future. Just two decades ago, built-in media centers were constructed with massive CRT televisions in mind. As flat screen panels have become the norm, the need to include extra depth for television footing is no longer a major design factor. While this is just one example, it goes to show that interior home design evolves along with the world around us, and it takes careful consideration to get the most out of your custom entertainment center. Today’s gaming consoles serve as all-in-one-media solutions, giving users access to all of their movies, music and games (if you’re into that) on one device. As such, they are the perfect item to make space for in your built-in media center. The good news is that although game consoles have increased in power over time, their overall footprint sizes have remained relatively consistent. If you plan on including this form of entertainment in your everyday life, be sure that your media center has at least a 2’x2’x2’ cubby with an open front, so you have somewhere to place your device. A flat shelf that rolls out when you want to access your gaming equipment works even better. If you have cable or satellite TV service, you might own equipment that is similar in size to a gaming console. The same goes for Blu-ray players, audio receivers and DVR equipment. Each of these devices will need a power source and enough room for storage and wires. Before you design your built-in media center, make a mental map of where you plan to locate all of these devices. It’s better to have too much storage than too little, so try to predict what purchases you’re likely to make in the future when it comes to home entertainment. When you’re remodeling a home, you have the chance to factor acoustics into your design. A sound system, whether you’re thinking in-wall surround-sound or otherwise, turns your room into the perfect place for immersive movie, music and TV show experiences. Depending on your setup, you may be looking for a place to store bookshelf speakers — consider including speaker cloth inserts on the left and right sides of your cabinetry. With these simple additions, you can stow away your speakers in a place nobody can see them, and still enjoy sound that fills the room. The centerpiece to many built-in media centers is the television. Even if you don’t watch much TV, making room for a flat screen panel should still be a strong consideration. You may decide to sell your home one day, and a large number of potential buyers expect a place to put their television. The general trend in home televisions is a “bigger is better” mentality. Televisions that measure 50” or larger are becoming much more common in American homes, as consumers seek to immerse themselves in their entertainment. If you plan to include space for a television in your built-in media center, include at least 60” in width and 40” in height to future-proof your space. A smaller television will always fit, but a larger one may not. A media center doesn’t just have to house cutting-edge entertainment. In fact, it can be the ideal place to store heirlooms you’ve held in the family for generations. You can change a room’s ambiance by storing items in your media center that add character. Show off a bit of your personality in your built-in storage with the following timeless items. You can get a glimpse into a homeowner’s style by looking at the titles in their bookshelves. 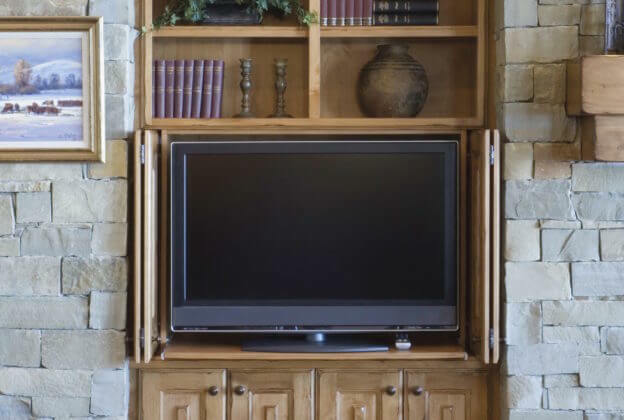 Built-in media centers often include shelving that works just as well as a standalone piece of furniture. You can include books throughout most of the entertainment center, or just use a few shelves for your favorites. Mix in craft books and the kids’ old yearbooks and reminisce over the coffee table. It’s possible to roll right up to your media center and be productive when you include a desk in your setup. A small indentation for legroom and a surface for your computer or files is all you need to create a comfortable seating area. If you plan on spending hours at this desk, consider other features like a pullout keyboard tray or a sliding cover to easily stow away your work. Your memories will last a lifetime when your home has family pictures that are always in plain sight. Utilize accent lighting to cast a soft illumination over your favorite photos, ideally with dimming functionality so you can turn down the lights when it’s time for a movie. Mix formal portraits with more laid-back pictures of everyday life to give your guests a glimpse of your memories. There are a large number of considerations to make when you’re exploring built-in home entertainment center ideas, but thinking through this part of a home is well worth the effort. With the right blueprints, you can create a part of your home that not only entertains, but also radiates aesthetic appeal. Don’t know where to start? Check out our custom home additions to see how we create built-in media centers that leave an impression on anyone who enters your home.